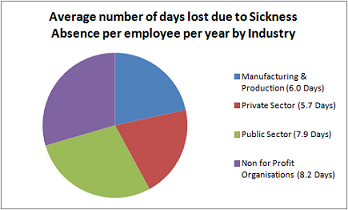 sick (source CBI, 2008 survey). The Chartered Institute of Personnel and Development (source CIPD’s 2009 Absence Management survey) estimate that sickness absence costs £666 per employee per year and averaged 6.4 days per employee; giving an average cost of just over £100/day. At just £100/day this estimate probably underestimates all the extra unquantifiable costs such as management time, loss of productivity, increased overtime or contractor levels. What is an Occupational Health (OH) Assessment? An Occupational Health Assessment is a medical examination performed by an Occupational Health Physician with an aim of addressing questions raised by the employer. Its primary aim is to advise management regarding the employee’s health issue and to make recommendations on what adjustments could be considered to ensure a safe/healthy working environment for that employee. It can also be an assessment of somebody’s fitness to work. Each Occupational Health report will be tailored to the employee and situation but it can include advice on the medical condition itself, symptoms, prognosis, the likelihood of recovery, what adjustments could be considered, and similar. The aim of the report is to inform Management and give them an expert medical opinion and sufficient information to enable them to make any onward decisions with appropriate knowledge. An occupational Health assessment is NOT normally intended for diagnosis or treatment purposes though in some cases the Doctor could make suggestions for the employee to discuss with their own medical practitioners. The employee still at work: An employee may be attending work regularly but could be showing signs of struggling and it may be the case that some timely changes are all that are required to keep them at work safely and productively. Regular short-term absences: Somebody with regular short-term absences could benefit from an assessment to ensure there are no underlying more serious health issues. Medium / Long term absences: Employees that have had substantial time away from work could be referred for an assessment. Return to Work: It may be appropriate for employees ready to return to work following a period of absence to be assessed so they can be integrated back in a safe and structured manner. A single one-off assessment is normally sufficient for most employees but for more serious illnesses then it may be appropriate to keep the employee under regular review. 1. HR to arrange a referral meeting with the employee at the company site/office to raise the issue of sickness absence. 2. HR to forward us a management referral form having obtained consent by the employee to do so.